One reason frozen food sales might be faltering is because of design. "That glass door. It really creates a fence," says food trend analyst Phil Lempert. Smith happened to have a coupon for frozen vegetables and figured they'd go nicely in the stew she'd planned for dinner. But Smith said she tends to buy fresh food, and that seemed true of most other shoppers there that day as well. "As you can see, it's kind of an empty aisle," she said, gesturing toward the cases of frozen pizza, fish fillets and egg rolls. Frozen food is a $53 billion a year business. That might sound like a lot, but it accounts for only about 6 percent of total grocery store sales. And frozen food sales have flattened or dropped by a percentage or so annually for the past few years. It's difficult to compete with the warmth and good smells of the deli department, which by comparison is carving out an ever-larger footprint in many grocery stores, adding pre-prepared delicacies such as sushi and chicken wing bars. 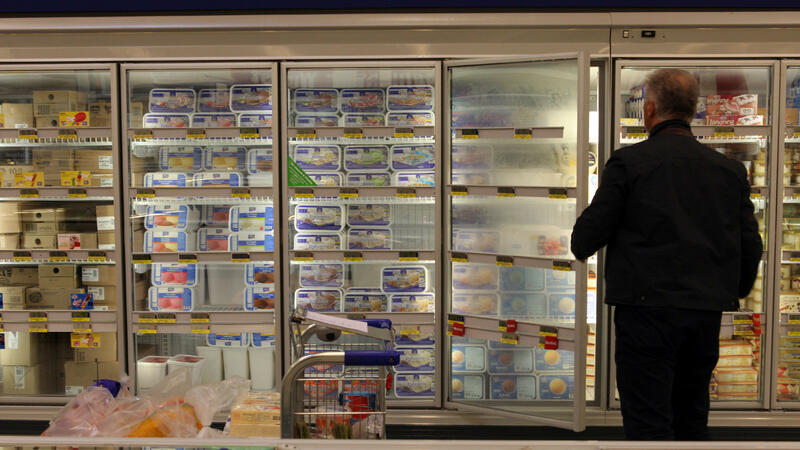 "Forty-six percent of shoppers on the typical trip, when they spend over a $100, they don't even set foot in the frozen food department," said Warren Thayer, who runs the trade magazine Frozen & Refrigerated Buyer. "It's hard. It's just an aisle. The best thing to do is curate your selection and decide, based on your local demographics, what's best for the shoppers in your area." Other challenges are apparent to analyst Phil Lempert, of the food and health website supermarketguru.com. "You are physically cold," he said of the disadvantages of shopping for frozen food. Plus, he adds, much of the problem comes down to design, including the packaging — a predictable blur of black Lean Cuisine, green Healthy Choice and red Stouffer's entrees. Then there's the literal wall between shoppers and food. "That glass door," Lempert says. "It really creates a fence." Of course, there are no glass doors at Trader Joe's. The company does not release sales figures, but "sales of our frozen products are doing great," said public relations director Kenya Friend-Daniel in an email. The difference? The stores are known for their open cases, called "coffin cases," that allow shoppers to reach in, rummage around and make discoveries. "It's fun to go through that case to see what you're going to find," said Lempert, who likened the experience to shopping in the produce department. Lempert said you can find frozen food similar to Trader Joe's at comparable prices at regular grocery stores, and he thinks those stores should be redesigned to make buying frozen food more enticing. For example, put frozen blueberries and strawberries in the produce department, he suggests, so when fresh fruit is out of season and shipped in from far away, it'll seem more obvious to shoppers to grab a bag of berries frozen at their peak. Just a few weeks ago, I went shopping in a small Whole Foods in Santa Monica and noticed the frozen food was in coffin cases — just like Trader Joe's. So I asked Alison Bodor, the head of the American Frozen Food Institute, why more grocery stores haven't followed that model. "Probably because freezer cases are a high-cost item," Bodor said. She added it'll take real innovation by manufacturers and grocery stories to make frozen sales — well, hot. Call this the freezing out of frozen food - you know, TV dinners, which were a novelty when they first showed up in national supermarkets back in the 1950s. UNIDENTIFIED VOICE ACTOR: It's the first and only three-course frozen dinner. GREENE: The first and only. But as NPR's Neda Ulaby reports, sales of frozen dinners have flattened or dropped over the past few years. NEDA ULABY, BYLINE: Grandmother Lynn Smith is picking up frozen vegetables in a Los Angeles grocery store to add to her evening stew. Do you buy a lot of your food in the frozen food aisle? LYNN SMITH: No I don't, as a matter of fact. ULABY: Neither do many other people shopping here today. SMITH: As you can see, it's kind of an empty aisle. ULABY: Frozen food is a $53 billion a year business. That might sound like a lot, but frozen accounts for only about 6 percent of total grocery store sales. It's hard to compete with the warmth and good smells of the deli section that's gotten so big in so many stores, says Warren Thayer. He edits of frozen food trade magazine. WARREN THAYER: Forty-six percent of shoppers on the typical trip, when they spend over $100, don't even set foot in the frozen food department. ULABY: Here's one reason why. PHIL LEMPERT: You're physically cold. ULABY: Food industry analyst Phil Lempert lays out why lots of frozen food is flailing. Ice cream is doing fine. So is organic stuff. But sales of frozen entrees have dropped by as much as 3 percent over the past few years when measured by volume. Lempert partly blames the predictable packaging. LEMPERT: The red Lean Cuisine, the green Healthy Choice. It's sort of, like, boring. ULABY: And frozen faces another design challenge. LEMPERT: That glass door - it really creates a fence. ULABY: You don't see those glass doors at Trader Joe's. The company does not release sales figures, but a spokesperson told NPR that frozen there is doing fine. Trader Joe's frozen food is not even that much different from what you can find in regular stores, says analyst Phil Lempert. But Trader Joe's has open cases. LEMPERT: It's fun to go through that case to see what you're going to find. ULABY: So why don't more grocery stores switch to the Trader Joe's model? I asked the head of the American Frozen Food Institute. ALISON BODER: Probably because freezer cases are a high-cost item. ULABY: Alison Boder says it'll take real innovation by manufacturers and grocery stores alike to give frozen entree sales more heat.